Prepare to unleash a new sensuality with the Viktor & Rolf Flowerbomb Midnight Eau de Parfum Spray, a floral fragrance for women with notes of powerful night blooming jasmine. The next chapter in the Flowerbomb story, this Eau de Parfum is a spellbinding and captivating scent designed to perfectly complement the modern day woman and her evening escapades. A warm and intoxicating composition, Flowerbomb Midnight opens with a sparkling blend of tantalising blackcurrant and pomegranate, before an alluring floral heart of dominated by night-blooming jasmine takes centre stage. In the base, white musk creates a deliciously moreish perfume that will leave an alluring trail wherever the night takes you. Though we love the scent, it’s the striking bottle design that has sparked our attention here at Escentual HQ! The iconic pink Flowerbomb bottle has been transformed with a sleek and collectable black design, accentuated by a rose-gold cap and logo. Capturing the floral freshness of the original fragrance and set alight to allow a more sophisticated and refined interpretation, we think this is a must for any Viktor & Rolf fan! 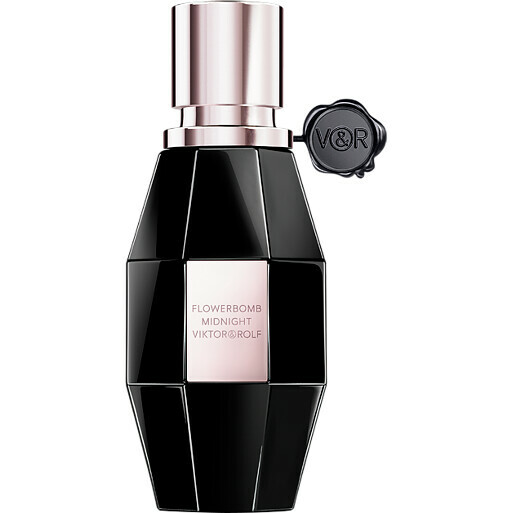 If you love Flowerbomb Midnight but want something a little more delicate for everyday wear, the original Viktor & Rolf Flowerbomb scent will not disappoint.